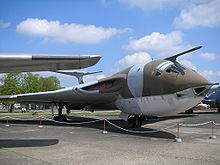 The Handley Page Victor was a British jet bomber aircraft produced by the Handley Page Aircraft Company during the Cold War. It was the third and final of the V bombers which provided Britain's nuclear deterrent. The other two V-bombers were the Avro Vulcan and the Vickers Valiant. Some aircraft were modified for strategic reconnaissance role using both cameras and radar. After the Royal Navy assumed the nuclear deterrence mission using submarine-launched Polaris missiles in 1969 many surviving bombers were converted into aerial refuelling tankers. 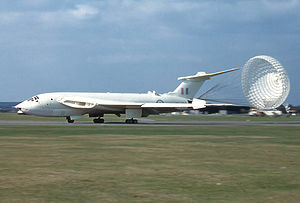 The last Victor was retired from service on 15 October 1993. Following the end of the Second World War, the British Air Ministry drew up its requirements for bombers to replace the piston-engined heavy bombers such as the Avro Lancaster and the new Avro Lincoln which equipped RAF Bomber Command. Its first ideas, which formed Operational Requirement OR.230 were for a long-range jet bomber, capable of carrying a 10,000 lb (4,500 kg) bomb load to a distance of 2,000 nautical miles (2,300 mi, 3,700 km) at a height of 50,000 ft and a cruise speed of 575 mph (925 km/h). Responses were received from Short Brothers, Bristol and Handley Page, but the Air Ministry realised that an aircraft to meet these stringent requirements would be technically demanding and would be so expensive that it could only be purchased in small numbers. As a result, realising that the majority of likely targets would not require such a long range, a less demanding specification for a medium range bomber, Air Ministry Specification B.35/46 was issued. This demanded the ability to carry the same 10,000 lb bomb-load to a target 1,500 nmi (1,725 mi, 2,800 km) away at a height of 45,000-50,000 ft (13,700-15,200 m) at a speed of 575 mph. The weapons load was to include a 10,000 lb "Special gravity bomb" (i.e. a free-fall nuclear weapon), or over shorter ranges 20,000 lb (9,100 kg) of conventional bombs. 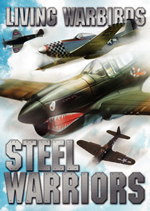 No defensive weapons were to be carried, the aircraft relying on its speed and height to avoid opposing fighters. Handley Page's design in response to B.35/46 was given the internal designation of HP.80. To achieve the required performance, the HP.80 was given a crescent wing developed by Handley Page's aerodynamicist Dr. Gustav Lachmann and his deputy, Godfrey Lee. The sweep and chord of the wing decrease in three distinct steps from the root to the tip, to ensure a constant limiting Mach number across the entire wing and consequently a high cruise speed. The HP.80 and Avro's Type 698 chosen as the best two of the proposed designs to B.35/46, and orders for two prototypes of each were placed. It was recognised, however, that there were many unknowns associated with both designs, and an order was placed for Vickers' design, which became the Valiant, which although not fully meeting the requirements of the specification posed little risk of failure and could therefore reach service earlier. The HP.80's crescent wing was tested on a ⅓-scale glider, the HP.87, and a modified Supermarine Attacker, the Handley Page HP.88. The HP.88 crashed on 26 August 1951 after completing only about thirty flights and little useful data was gained during its brief two months of existence. By the time the HP.87 was ready the HP.80 wing had changed such that the former was no longer representative. At any rate, the design of the HP.80 had sufficiently advanced that the loss of the HP.88 had little effect on the programme. Two HP.80 prototypes, WB771 and WB775, were built. The Victor was a futuristic-looking, streamlined machine, the engines buried in the thick wing roots and a large, highly swept T-tail with considerable dihedral on the horizontal stabilisers. A feature of the Victor was the prominent chin bulge that contained the targeting radar, cockpit, nose landing gear unit and an auxiliary bomb aimer's position. Unlike the Vulcan and Valiant, the Victor's pilots sat at the same level as the rest of the crew, thanks to a larger pressurised compartment that extended all the way to the nose. As with the other V-bombers, only the pilots were provided with ejection seats; the three systems operators relying on "explosive cushions" that would help them from their seats and towards a traditional bail out. The rear seats incorporated a cushion inflated by a CO2 bottle. 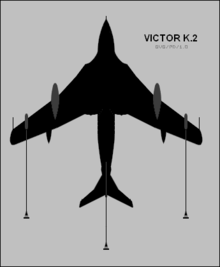 The Victor's bomb bay was much larger than that of the Valiant and Vulcan, which allowed heavier weapon loads to be carried over shorter ranges. As an alternative to the single "10,000 lb" nuclear bomb as required by the specification, the bomb bay was designed to carry a single 22,000 lb (10,000 kg) Grand Slam or two 12,000 lb (5,500 kg) Tallboy earthquake bombs, up to 48 1,000 lb (450 kg) bombs or 39 2,000 lb (900 kg) sea mines. Underwing panniers were planned (although never built) which could carry a further 28 1,000 lb bombs. HP.80 prototype WB771 was broken down at the Handley Page factory at Radlett and transported by road to RAF Boscombe Down for its first flight. Bulldozers were used on the route to create new paths around obstacles. The sections of the aircraft were hidden under wooden framing and tarpaulins printed with "GELEYPANDHY / SOUTHAMPTON" to make it appear to be a boat hull in transit. GELEYPANDHY was an anagram of "Handley Pyge" marred by a signwriter's error. It made its maiden flight on 24 December 1952. The HP.80 prototypes performed well, but there were a number of design miscalculations that lead to the loss of WB771 on 14 July 1954, when the tailplane detached when making a low-level pass over the runway at Cranfield, causing the aircraft to crash with the loss of the crew. Attached to the fin using three bolts, the tailplane was subject to considerably more stress than had been anticipated and the three bolts failed due to metal fatigue. Additionally, the aircraft were considerably tail heavy. This was remedied by large ballast weights in the HP.80 prototypes. Production Victors had a lengthened nose that also served to move the crew escape door further from the engine intakes. The fin was shortened to eliminate the potential for flutter while the tailplane attachment was changed to a stronger four bolt fixing. Production B.1 Victors were powered by the Armstrong Siddeley Sapphire ASSa.7 turbojets rated at 11,000 lbf (49 kN), and carried the Yellow Sun nuclear weapon when it became available, although Victors also carried US-owned Mark 5 nuclear bombs (made available under the Project E programme) and the British Red Beard tactical nuclear weapon. A total of 24 were upgraded to B.1A standard by the addition of Red Steer tail warning radar in an enlarged tailcone and a suite of radar warning receivers and electronic countermeasures (ECM). On 1 June 1956, a production Victor XA917 flown by test pilot Johnny Allam inadvertently exceeded the speed of sound after Allam let the nose drop slightly at a higher power setting. Allam noticed a cockpit indication of Mach 1.1 and ground observers from Watford to Banbury reported hearing a sonic boom. 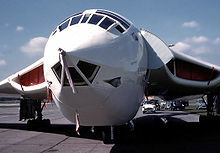 The Victor was the largest aircraft to have broken the "sound barrier" at that time. The B.2 was an improved Victor powered by the Rolls-Royce Conway RCo.11 turbofan engines providing 17,250 lbf (76.7 kN). This required enlarged and redesigned intakes to provide greater airflow. The wing was stretched and incorporated two speed pods or Kx�chemann carrots. These are anti-shock bodies; bulged fairings that reduced wave drag at transonic speeds (see area rule). Unlike the B1, the Mk 2 featured distinctive retractable elephant ear intakes on the rear fuselage forward of the fin. These scoops fed ram air to turbine driven alternators, thus their name "Ram Air Turbine (RAT) scoops. In the event of a high altitude flame out, for example from a nuclear shock wave, the loss of electrical or hydraulic power would trigger the RATs to open and provide emergency electrical power until the main engines could be relit. The right wing root also incorporated a Blackburn Artouste airborne auxiliary power plant (AAPP) or airborne auxiliary power unit (AAPU). This small "5th" engine provided high pressure air for engine starting, and provided electrical power on the ground, or in the air as an emergency back up in the event of main engine failures or flameout. The APU was also a useful feature to support operations away from specialist Victor support equipment. The aircraft also featured an extension at the base of the fin containing ECM cooling equipment. With the move to low level penetration missions, the Victors were fitted with air to air refuelling probes above the cockpit, large underwing fuel tanks and received a two tone camouflage finish in place of the Anti-flash white. Trials were also conducted with terrain following radar and a side scan mode for the bombing and navigation radar but neither became operational. Nine B.2 aircraft were converted for strategic reconnaissance purposes to replace Valiants withdrawn due to wing fatigue. They received cameras, a bomb bay mounted radar mapping system and wing top sniffers to detect particles released from nuclear testing. Picture - An RAF Victor at the Civil Air Terminal, NAS Bermuda ca. 1985. The withdrawal of the Valiant fleet left the RAF with a shortfall in front line tanker aircraft, so the B.1/1A aircraft, now judged to be obsolescent in the strike role, were refitted for this duty. Six B.1A aircraft received a two point system with a hose and drogue system carried under each wing as B.1A (K2P). Fourteen further B.1A and 11 B.1 were given a more thorough conversion, receiving bomb bay fuel tanks and a centreline dispenser unit as three point tankers, the K.1A/K.1 respectively. The remaining B.2 aircraft were not as suited to the low level strike mission as the Vulcan with its strong delta wing. This, combined with the switch of the nuclear deterrent from the RAF to the Royal Navy (with the Polaris missile) meant that the Victor was now surplus to requirements. Hence, 24 B.2 were modified to K.2 standard. Similar to the K.1/1A conversions, the wing was trimmed to reduce stress and had the nose glazing plated over. The glazing was reintroduced, on some aircraft, for reconnaissance missions during the Falklands war. The K.2 could carry 91,000 lb (41,000 kg) of fuel. It served in the tanker role until withdrawn in October 1993. The improved Victor B.2 started to be delivered in 1961, with the first B.2 Squadron, No. 139 forming in February 1962, and a second, 100 Squadron in May 1962. These were the only two bomber squadrons to form on the B.2, as the last 28 Victors on order were cancelled. In November 1963, a detachment of four Victor B.1As was deployed to RAF Tengah, Singapore in support of Commonwealth forces during the Borneo conflict. Although two Victors were at one stage loaded with live conventional bombs and readied to fly operational sorties, they did not need to fly combat missions, and were replaced by Vulcans in September 1964. It was also the last V bomber to retire, nine years after the last Vulcan (although the Vulcan survived longer in its original role as a bomber). It saw service in the Falklands War and 1991 Gulf War as an in-flight refuelling tanker. Porposed military tactical transport based on HP.111 and fitted with blown flaps. Rejected in favour of Armstrong Whitworth AW.681. No. 10 Squadron RAF operated B.1 variant only. No. 15 Squadron RAF operated B.1A variant only. No. 55 Squadron RAF operated B.1, K.1 & K.2 variants. No. 57 Squadron RAF operated B.1, K.1 & K.2 variants. No. 100 Squadron RAF operated B.2 variant only. No. 139 (Jamaica) Squadron RAF operated B.2 variant only. No. 214 Squadron RAF operated K.1 variant only. No. 543 Squadron RAF operated B(SR).2 variant only. 20 August 1959: XH668 a B2 of the AAEE lost a pitot head and dived into the sea off Milford Haven, Pembrokeshire. 23 March 1962: XL159 a B2 of the AAEE stalled and dived into a house at Stubton, Lincolnshire. 16 June 1962: XA929 a B1 of 10 Squadron overshot the runway and broke up at RAF Akrotiri following an abandoned takeoff. 2 October 1962: XA934 a B1 of 'A'Squadron, 232 OCU had an engine fail on take off from RAF Gaydon after which the 2 engines failed on approach. The aircraft crashed into a copse several miles from RAF Gaydon. Of the 4 crew on board only the co pilot survived. 29 June 1966: XM716 a SR2 of 543 Squadron was giving a demonstration flight for the press and television at RAF Wyton. The aircraft had made one high-speed circuit and was flying low in a wide arc to return back over the airfield when the starboard wing was seen to break away and both it and the rest of the aircraft burst into flames. All four crew were killed. The aircraft was the first SR2 to enter service with the squadron, and released evidence suggests that it was overstressed. 24 March 1975: Victor K1A XH618 of 57 Squadron was involved in a midair collision with Hawker Siddeley Buccaneer XV156 during a simulated refuelling. The Buccaneer hit the Victor's tailplane causing the aircraft to crash into the sea 95 mi (153 km) East of Sunderland, County Durham. 19 June 1986 XL191 a K2 of 57 Squadron undershot approach in bad weather at Hamilton, Ontario. 3 May 2009: During a "fast taxi" run at Bruntingthorpe Aerodrome, XM715 made an unplanned brief flight, reaching a height of about 30 ft before being landed. The aircraft does not have a permit to fly. The Civil Aviation Authority (CAA) stated that they will not be conducting an investigation. The causes have been identified as the co-pilot failing to reply to the command "throttles back", thus resulting in the pilot having to control the throttles himself, resulting in a brief loss of control of the aircraft, causing it to rise. No legal action is to be taken by the CAA against either of the crew aboard XM715 or the operators of Bruntingthorpe Airfield. XH648: a B.1A (K.2P) at the Imperial War Museum Duxford, Cambridgeshire. The only Mark 1 to survive and the only one with bombing capability preserved (bomb doors and bomb aimer's positions are visible signs of this). XH672: Maid Marian, at the Royal Air Force Museum, Cosford, Shropshire, in the new Cold War building. XH673: Gate guardian at RAF Marham, Norfolk, the Victor's last home. XL231: Lusty Lindy, at the Yorkshire Air Museum, York. The prototype for the B.2 to K.2 conversion. XM715: Teasin' Tina/Meldrew, at the British Aviation Heritage Centre, Bruntingthorpe, Leicestershire. The names, and accompanying nose art, were applied during the 1991 Gulf War. 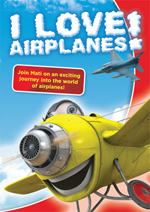 Of these, Lindy and Tina are the only "live" aircraft. They are run up regularly, performing high speed taxi runs with parachute braking at annual events. A Handley Page Victor features prominently in the 1962 British movie comedy The Iron Maiden. A number of sequences show the aircraft in closeup, taxiing, taking off, climbing, flying past and landing with parachute deployed. Although a bomber, in the film it purports to be a prototype supersonic jetliner designed by the protagonist. Buttler, Tony. "Vital Bombers: Origins of the RAF's 'V-Bomber' Force". Air Enthusiast, No. 79, January/February 1999, pp. 28-41. ISSN 0143-5450. Donald, David. "Warplane Classic: Handley Page Victor." 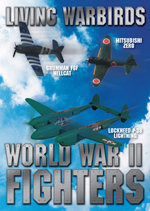 International Airpower Review, Issue 25, 2008, pp. 124-153. Westport, CT: AIRtime Publishing. ISSN 1473-9917. Gunston, Bill. Bombers of the West. London: Ian Allan, 1973, pp. 78-102. 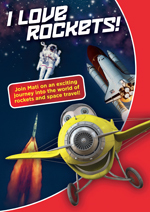 ISBN 0-7110-0456-0. Gunston, Bill. "The V-Bombers: Handley Page Victor, Part 2". Aeroplane Monthly, February 1981, Vol. 9, No 2, pp. 60-65. ISSN 0143-7240. Leich, Andy. "V Force Nuclear Arsenal: Weapons for the Valiant, Victor and Vulcan". Aiir Enthusiast, No. 107, September/October 2003. pp. 52-59. ISSN 0143-5450. "Parade of Victors: No. 10 Squadron at RAF Cottesmore". Flight, 19 September 1958, pp. 493-496. "Victor: A Technical Description of Britains Latest V-Bomber". Flight, 30 October 1959, pp. 463-472. Handley Page Victor Pictures and Handley Page Victor for Sale.